Went snorkeling with Manta Rays this month, and we learned that taking me on spontaneous vacation is no longer a wonderful idea. Had never been to Hawaii, but it was a whirlwind trip. Have spent close-up time with several other animal-encounter modes; Hands-on 1-hr visit with octopus, 1-hr visit with penguin, held baby jaguar, raised a coyote pup, etc. But these were not in their own natural “wild” environment during our close-encounter. Encounter this month was different. Much appreciate the photos and video we have, but my senses were so overwhelmed that i have only retained two mental “snapshots”; one was when husband said that he wanted to share this experience with me. He requested we take time and money to snorkel with the manta ray. And the other was a mental snapshot of the white under-side of a manta … almost touching my nose. 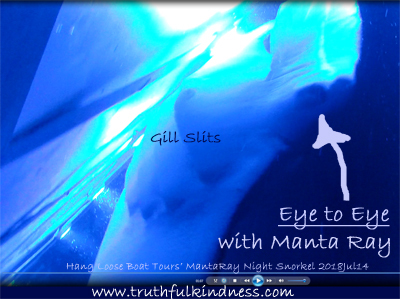 Contacted Hang Loose Boat Tours for MantaRay Night Snorkel Tour (link below). Notified them of my dementia symptoms to minimize surprises. 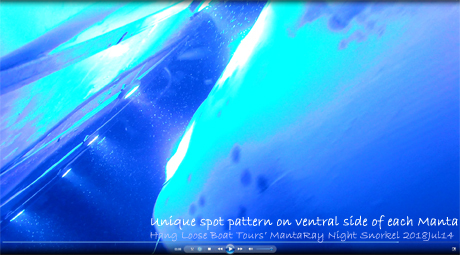 Arranged for someone to swim down and video the manta ray encounter from deeper in the ocean. So husband got home Wednesday night. Thursday he took me to try on several full-length wet-suits, and rented one for the weekend, then packed. Left Friday morning, driving 5hrs to airport then flying 6hrs, and arriving in Hawaii equivalent of about 1am our time. Obviously i was THOROUGHLY exhausted (my bed time is before 10pm). We got up Saturday morning, and had leisurely drive to “Turtle Bay” , (because i have a thing about turtles). 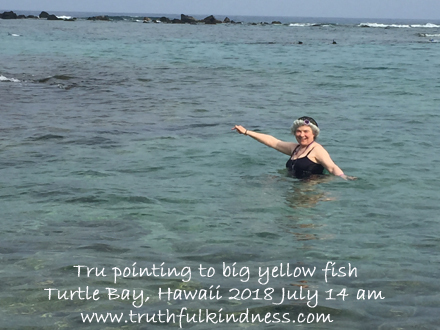 Did not see any turtles, but quite a few rather-large colorful fish. 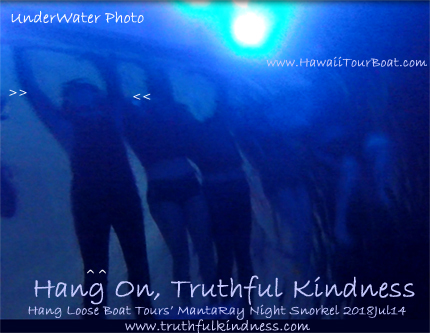 About 5pm (8pm Pacific Time) it was time to gather for Manta Ray excursion. It was an exciting boat ride, with choppy waves, and dolphins playing in the wake of the boat. i was very glad i had taken a pill for motion sickness. There was loud music playing along with excited squealing from fellow passengers, and i was very glad that i had remembered several sets of ear plugs. Water and air was sparkling clean — not affected by volcanic smoke or ash. Simon and crew helped me into the water. Unfortunately i forgot this Night Snorkel with Manta Rays trip would last much longer than my sugar level from eating would last. I need to eat every two hours, or blood sugar crashes. Excited squealing from fellow persons in close-encounter with MantaRay, my own excitement, choppy water during boat trip, and pressure of holding my arms above my head for extended time all contributed for a sugar crash. Consequences of not thinking things through to plan well were extreme shaking, unable to hold onto the light bar, suspect i hyper-ventilated, and needing to go back to the boat. After helping me out of the water, Simon and crew realized i was having problems, got me back to my seat in a quieter (and most stable) part of the boat, offered me some snacks, and the traditional “chum bucket”. They checked on me several times and kept an eye on me constantly. After the boat docked, an assistant helped husband get me back up to the car, then hung around to make sure i was okay (since did not have walker with me on the boat). … but i smiled as i fell asleep. Next day, Sunday, we had leisurely breakfast then afternoon return flight of about 6hrs. We spent Sunday night at motel before 5-hour drive home on Monday, but better planning on our part (mine and care-partner) would have made this a truly exceptional encounter. Completely new activity, in completely new environment (under water), using completely new sets of mental and neurological systems. (Good for neuro-plasticity). Wonderful photos and underwater video of trip. We ordered (and today received) stuffed toy Manta to add for my memory collection, providing daily reminder of the close-encounter. NEED to plan one day on each side of an event, (even travel) to wind down. Need to remember blood sugar level in all phases of planning process. 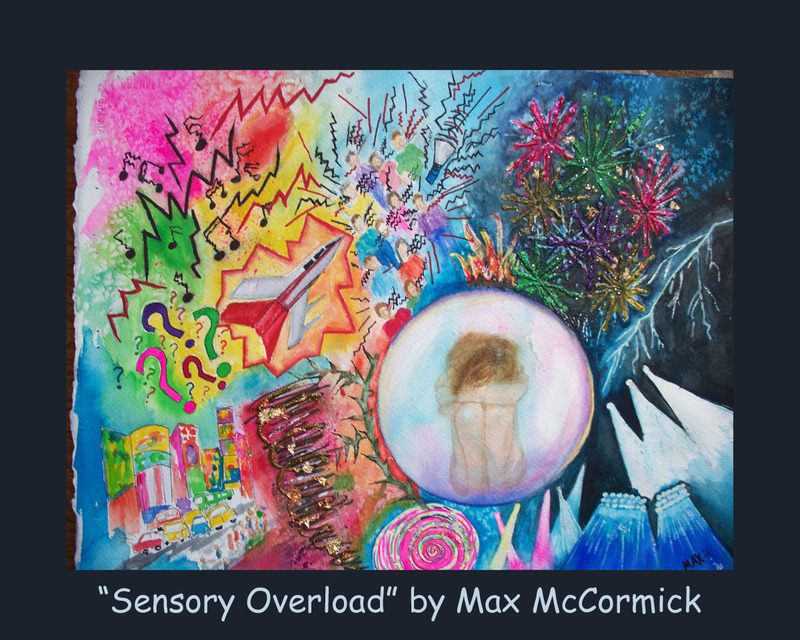 Need to consider sensory overload (sight as well as sound) as a strong element for exhaustion, as well as physical exertion. If you want souvenirs, then plan TIME for that activity. Need to confirm in writing, BEFORE payment, that travel seating is adjacent to care-partner. * Admin issues: SHARE dementia awareness thru buttons below. Feel free to leave your thoughts in the form of comments, but please filter your comments with truthful loving kindness to all concerned. If interested in receiving notice of future blog postings, subscriptions are available through a “follow” button in the upper left corner (MS Explorer) or lower right (Safari, Mozilla Firefox and Chrome). If there is an advertisement below, I have no control over what is shown. My own full legal name is Truthful Loving Kindness. My current diagnosis is still Mild Cognitive Impairment, but my neurologist said I am in a unique position for helping because I have “one foot in each door”. Text Copyright © 2018-07/30. Tags are: animal, dementia, PLwD, strategy, symptom, travel. This entry was posted in Dementia Symptom Tips, Journal, Symptoms, travel and tagged animal, dementia, PLwD, strategy, symptom, travel. Bookmark the permalink. That was truly a breath taking description of your excursion!! Its sound like a wonderful trip and opportunity and, in the end, I hope you enjoyed it aside from the planning as you noted and the sensory overload of the entire day. The sugar crash was the scariest episode as communicating in that frame of mind is difficult at best without being under water!! At least when I crash Iâm usually at home in my own surroundings. So thankful you had astute eyes watching over you!! Again, some great pointers for everyone involved to incorporate when planning extraordinary outings including being very aware of the diabetic aspect. Anyway, this adventure could be a candidate for a reality show!! Thank you for sharing â¦ more lessons learned. It looks like a wonderful trip! I’m sure you will remember your manta ray encounter (with the help of the video and stuffed animal) for a long time. Kudos for taking some time off for you and Guy – maybe more time next time! Wow a brave thing to do and an exciting one (although the sugar crash does not sound so good). I also find the excitement of others often overwhelming but, being so close to a manta ray must have been wonderful. A soft manta ray toy will be great for your memory box.